An offer we hope you can't refuse! Now is a smart time to re-check your hearing and look into trading in your current Miracle-Ear® hearing aids. We have new technology that will connect you better with family and friends. %%ProductOffered%% will make listening to your favorite music and TV programs more enjoyable by streaming sound directly to both ears. And it will help you hear more naturally than you ever thought possible with hearing aids. 1 Promotional offers, gift offers, coupons, and discounts not available when coverage or discounted pricing is provided under the Medicare or Medicaid programs. 2 Insurance benefits of any kind, including Medicare and Medicaid, cannot be combined with any promotional offer, gift offer, coupon or discount in Massachusetts, Minnesota, Mississippi, Ohio, and Utah. 3 Promotional offers, gift offers, coupons, and discounts are not available in connection with benefits provided through worker’s compensation in Minnesota, Mississippi, Nevada, and Ohio. Enjoy your favorite TV shows—use the TV streamer accessory to hear your favorite TV shows in high-quality Dolby® Digital sound, directly to your GENIUS™ 3.0 hearing aids. Hear sounds more naturally—with 60% more processing power1 than previous technology, you’ll experience listening so realistic and natural you may forget you’re wearing hearing aids. A more natural sounding voice—patented Voice Recognition Technology recognizes your own voice so you hear it as naturally as possible. Hear telephone conversations, music and videos—in vibrant stereo, with direct streaming from your smartphone to both ears. 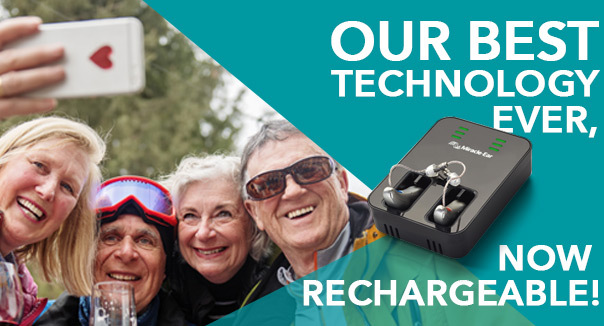 Freedom from batteries—because GENIUS™ 3.0 is also rechargeable, so you never have to purchase or change your hearing aid batteries again. Thank you for being a valued Miracle-Ear customer!